What To Do With All This Yarn? After knitting for 20+ years, I’ve acquired quite a bit of yarn. My yarn collection has a history all its own. Like fashion, the color of yarn, texture and composition of fiber, records trends and style of a particular time period. Does yarn marketed by the various companies define a trend or does the knitter define the trend? When I began knitting, my first project was a sweater. Scarves, shawls, socks and lace knitting were not on my radar. Self-stripping yarn (Regia) emerged and I couldn’t wait to knit a pair of socks on DPNs. My knitting began to reflect my attraction to stitches creating patterns and dimension, texture and color. In the late 80s and 90s, my worldview of knitting became a melting pot of yarn selection and pattern design. The cross-pollination of knitting culture introduced a plethora of options from reading a Japanese knitting schematic, sitting next to a continental knitter, and a variety of knitting books drawing upon traditional folk costume and ethnic motifs from all parts of the globe. So, what do I do with 20 balls of Filatura di Crosa Zara? 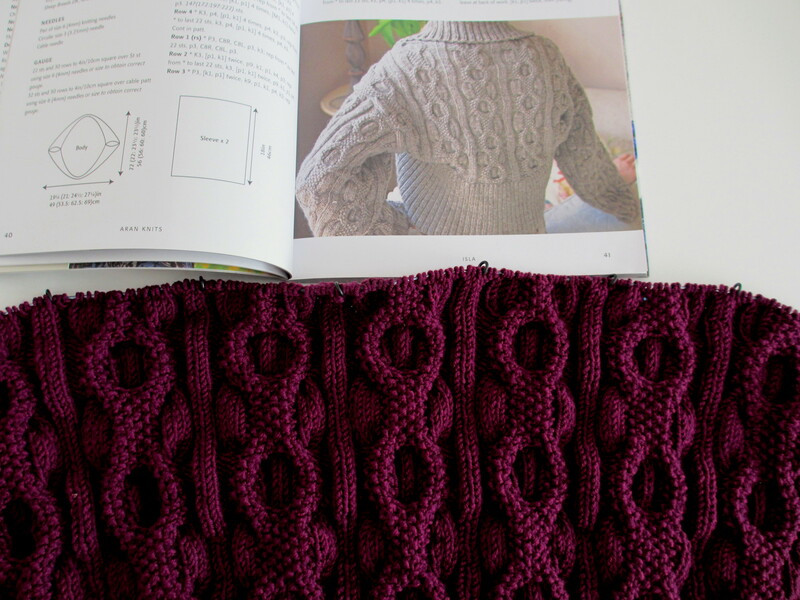 Isla, a shrug designed by Martin Storey, “knit in a medallion seed stitch cable pattern with a deep rolled collar and brilliant deep curved welt” appears in Aran Knits, 23 Contemporary Designs Using Classic Cable Patterns. A project influenced by traditional fisherman’s sweaters found on the ganseys of the British Isles.